Expand your thinking and return to your job – and your life – with fresh ways to approach challenges and build better retail experiences. The future of retail relies on creating great shopper experiences. Develop a mindset of innovation and creativity at Shop!X 2019. Disney’s former head of Innovation and Creativity will host a one-day workshop at Shop!X 2019 — and you are invited! This dynamic presenter will shake things up and help you learn by doing. Workshop participants will leave with tools to instill creativity at all levels your team. INNOVATION WORKSHOP with Duncan Wardle – Instill creativity at all levels of your team with tools from Disney’s former head of Innovation and Creativity. THE RETAIL CHALLENGE – Join colleagues to tackle a real-world retail problem in a 24-hour competition. THE EXCHANGE – Get face-to-face with potential business partners in popular speed networking format. 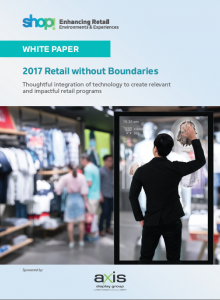 RETAIL TOURS – Go behind the scenes to see some of the latest technology, fixtures, and design strategies in retail. ECONOMIC UPDATE – Find out what to expect from the economy in 2020 and beyond from global consultant ITR Economics. SHOP! NIGHT OF HONORS AWARDS DINNER – Join us to celebrate new inductees into the Shop! Hall of Fame, announce the Andrea Martin Volunteer of the Year and recognize Shop! Women of Distinction honorees. See more photos of Shop!X2018 here. Hope to see you at Shop!X 2019. Stay tuned for more details. Shop!X is so much more than an annual association meeting. The two-day conference is packed with sessions and interactive workshops that directly relate to real-world retail experiences and business practices to help keep your operations relevant. Shop!X is also a celebration of our remarkable members, an opportunity to meet new business partners or network with old friends.